During the early 90s Toyon had a steady pattern of mainly publishing poetry. During this time, the journal was coincidently advised under Judith Minty. As advisors changed towards the middle of the decade they began publishing visual artwork. This led to some style changes within their volumes, showcasing a lot more creative design aspects with their content and format. The fact that there are two 1995 issues is an interesting thing to note with each having different faculty advisors (with vol. 41 being under Kim T. Griswell and vol. 42 being Vince Gotera). The first issue of 1995 shows us the first of a more visually creative approach in the mid-late 90s. In vol. 41 there were surprisingly two winners of the Richard Carver Writing Contest, which were Andrew M. Silberman and Richard Rowell Noonan. The vol. 42 issue, however, hadn’t given out any awards at all. The 1995 vol. 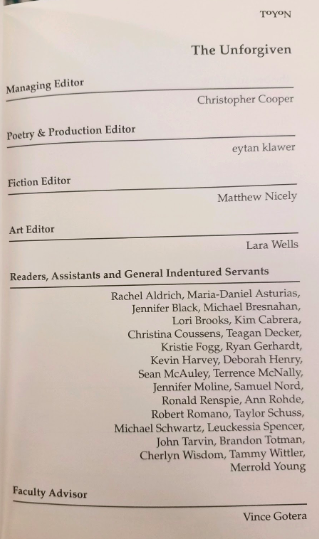 42 issue shows a creative twist with titles, labeling the staff page as “The Unforgiven” and listing the staff who aren’t editors as “Readers, Assistants and General Indentured Servants”. This, when combined with the cover art and the font choice, the design of the issue creates an interesting tone throughout the issue that seems to be centered around the horror genre. Toyon Literary Magazine Volume 41. Pg. 3, Humboldt State University Library, Arcata, California. The table of contents as mentioned above from the 1995 issue, advised under Vince Gotera, displaying the creative titles for the members of the staff. The 1996 vol. 43 that was advised by Dan Levinson has its own unique aspects with several font styles displayed throughout the issue. The issue’s style was littered with pull quotes and had many full-size art pieces taking up pages. This could be echoing the creative visual approach that started in issues 41 and 42. ​We don’t see another Toyon issue however until 1998 with Vol. 44, which is under once again under Levinson. According to Levinson in the acknowledgments, he has gotten help in different aspects of getting the issue finalized and published, one of them being Jim Dodge who took over as the faculty advisor for the 1999 issue. Visual art has been in a few issues at this point and appears to become a grounded staple in Toyon even with issues with a more conventional interior design. The 1999 issue establishes the Advisors Award that was won by Kendra Dwelley, which is an award that was later renamed after Richard Cortez Day. The award has been funded by Jim Dodge since its founding, and the award honors a work of fiction published in each issue. Fall 1999 was also the first year that the Toyon was published in ENGL460, a class established to facilitate the production of the journal. The last paid advertisement to appear in Toyon in 1990. Photo by author. Throughout Toyon’s past, editorial teams have made frequent and often creative use of the front and back matter. They have included such standard features as editorial letters, extensive acknowledgements, and mission statements. Interestingly, for a brief period from 1983 to 1987, and once more in 1990, local businesses were advertised in the literary magazine’s back matter. Local businesses including Northtown Books, Tin Can Mailman, and Bug Press, were all featured in advertisements during this period. In 1987, a total of seven advertisements (the most that appeared in a single issue) were included among the issue’s back matter. In 1990, Toyon featured a full-page advertisement for The Walrus & The Carpenter--a local bookstore and cafe no longer in operation--in the issue’s back matter. Since 1990, no advertisements of any type have appeared in Toyon. The use of advertisements marked a memorable and unique period in the life of Toyon.